A man's -- or woman's -- home is their castle, correct? Well … sometimes. Although you might think you have the right to do whatever you want in the privacy of your backyard, your local government may have very different ideas. Quite a number of practices are restricted by federal, state, or local law, even on your own property, usually for reasons of hygiene and safety. Make sure you know your local regulations before trying any of these. DISCLAIMER: This article is for general informational purposes and not intended as legal advice. 1. Collecting rainwater. While "direct rainwater collection" is okay, rainwater, roof water, and meltwater harvesting are not sanctioned in many US states. This means your harmless-looking rain barrel or cistern may be illegal. 2. Using greywater (aka "graywater"). 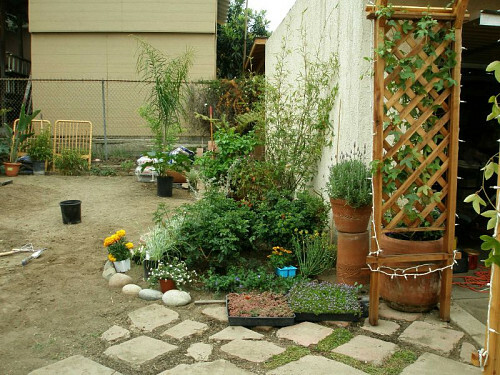 Repurposing the runoff from laundry, dishwashing, or showers to water your garden is a no-no in certain areas. 3. Watering your lawn when and how much you please. If an outdoor water-use restriction is in effect, irrigation may be permitted only at certain times and on specific days of the week, if at all. 4. Digging a pond. Would you like to have your own backyard pond to store water, to swim in, or for any other purpose? You will need to check with your local government before you lift a shovel. 5. Raising chickens. Your right to harbor hens depends on zoning laws for your area. For example, Multnomah County statutes require you to file for a permit to keep more than three chickens on your property in Portland. A fence should surround your chicken enclosure to keep them safe and keep out rodents. In addition, you must inform your neighbors within 150 feet of the property line of your plan. 6. Keeping vehicles on your property that are not registered to your address, licensed, and operable. (If all the criteria are met, though, there is no limit to the number of vehicles you can have on your land.) Storing a vehicle with GVW (gross vehicle weight) of over 11,000 pounds is also proscribed unless you get land use approval. 7. Holding a fundraiser or any event for which you charge admission, especially if alcohol will be served. 8. Disturbing a legally registered archaeological site. However, you could be entitled to benefits such as tax breaks and easements, and any artifacts found might belong to you. The correct procedure if you find what may be a historical artifact on your land: leave the object where it is and contact the state official in charge of historical preservation. 9. Digging for gold if the mineral rights to your property have been signed away by: you, the house's builder before you bought your home, or any other authorized person. 10. Keeping cuttings from a neighbor's trees. While in most areas you or your agent have the right in common law to trim branches that extend over your property line, may not do so in a way that causes irreparable harm to the trees. And sorry, but the cut wood is off limits. 11. Composting whatever you wish. Adding cooked food, meat, fish, human or animal wastes, sewage sludge, or synthetic nutrients to a compost pile is prohibited in many areas, as is application of compost made from any of these substances to your garden. 12. Camping. Camping out on your own property, whether in a tent, RV, or anything that could be termed a temporary shelter, is completely forbidden in some urban centers. Even in a more rural area, long term camping on residential property may be prohibited. What is the definition of "short term"? Usually it is less than 30 days. In addition, each camper may be required to have a bedroom in the house. 13. Growing (too many) vegetables. Urban gardening is not allowed in some US cities. Even if you are permitted, there may be limits on how much produce you can grow.